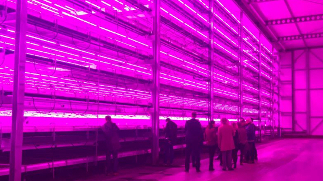 In Warmenhuizen, located in Seed Valley, the first fully automated foil greenhouse with hydroponics in the Netherlands was opened on Thursday 31 January 2019 under the name B4HydroGrow. 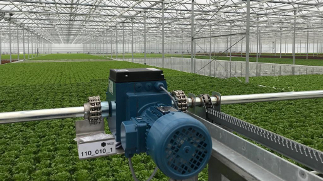 Bosman Van Zaal is closely involved in the development of this project and realised the heating in the greenhouse and the climate in the growth cell, the logistical cultivation systems and the higher-level management software ISAL from Indigo Logistics. "We manage the green pharmacy", according to a proud Fred Berkhout of B-Four Agro. Together with entrepreneurs Willem Bas and Bart Bak, he founded B4HydroGrow. A vegetable nursery, including seven lettuce varieties that are supplied exclusively to all 1000 Albert Heijn branches. Originally grown outdoors in the open, the desire is to grow year-round, in a sustainable manner and with consistent quality. It all starts with small seeds, which are placed in a special plug in trays on aluminium roll containers. These roll containers are then transported to a conditioned room, a vertical farm of ten layers. 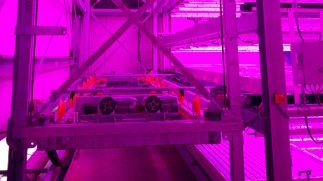 In this environment, climate, (LED) light and air are fully optimised thanks to automatic growth analyses. This complete process does not require human intervention. When the plants have reached the correct size, they are placed in the cultivation tray by a transplanter, which then floats to the foil greenhouse. The used containers are automatically washed and prepared for reuse for a new load of plants. The trays with plants end up in the water basins in the foil greenhouse. The film allows UV light to pass through completely and more diffusely, making optimum use of the natural cycle. The result is a nicer colouring of the lettuce. Moreover, foil is more flexible than glass in extreme weather conditions and is safer for food production. The advantages of growing in trays in basins are that there is no more wasted water, pesticides are hardly necessary and the crop remains cleaner. In addition, the plants "travel" fully automatically from start to finish in continuously circulating and flavoured water. Because less mechanics are required, investment costs are at an acceptable level. 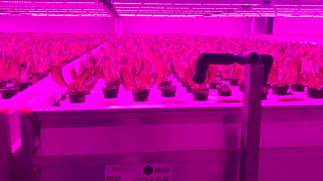 Finally, the room temperature in the greenhouse is continuously kept at the right temperature, so that lettuce of a constant quality can be produced even at an outside temperature of -10 or +30 degrees Celsius. After about seven weeks the heads of lettuce are ready to be harvested and distributed. The company structure is almost completely circular. Biofermentation is used to generate energy, using the residual flows as input. The biogas is upgraded to natural gas quality and fed back into the gas grid. CO2 is separated which is used in the growing rooms. This production process promotes a considerable environmental and social benefit. The traditional method of large-scale cultivation of lettuce in greenhouses on hydroponics is based on specially developed plastic gutters, in which the plants hang and the water flows along the roots. 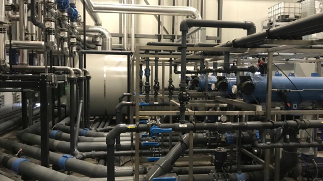 "This method in large basins is the next step, because it is very suitable for large-scale cultivation with relatively simple automation," says Arjan Kok, Chief Technical Officer of Bosman Van Zaal. "We expect this concept to be applicable outside the Netherlands as well". B-Four Agro expects to harvest as many heads of the three hectares as on 100 hectares of open ground. 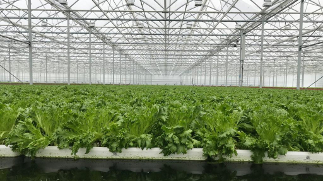 "This shows that growing on water is also a means to be successful in a hybrid environment of vertical farming and the more traditional poly greenhouses. February 22, 2019 Take a look inside our new building with production facility at the Braziliëlaan 4 during our Open Day on March 16!